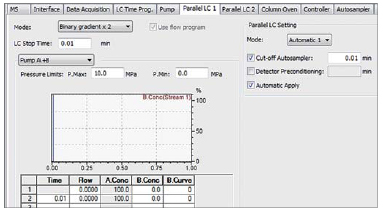 In addition to high-throughput data acquisition, Nexera MX supports various processes from batch setting to data analysis with sophisticated software, improving the efficiency of overall operations. The MX Solution software was designed exclusively for Nexera MX. It realizes simple operability with the minimum status displays and reduced click operations. Analysis starts by simply clicking three buttons. The rack plate usage status and analysis progress are graphically displayed during analysis, allowing for easy checking at a glance. A large volume of data can be analyzed using LabSolutions Insight and LabSolutions. 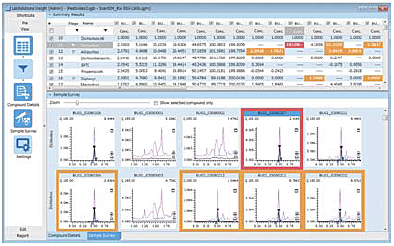 The flagging function of LabSolutions Insight quickly finds data deviated from the standard values from among a large volume of data, dramatically reducing the number of data sets that need to be checked and facilitating quantitative process effectively.